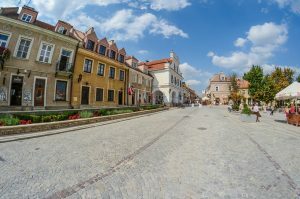 A picturesque location and an impressive wealth of finely preserved historic monuments have earned Sandomierz a reputation as one of the most beautiful towns in Poland. At one time it played a role of great importance in the life of the country, but nowadays it is simply a rural town of great beauty. The surroundings of Sandomierz are known for their scenic charm and an abundance of fascinating historic remnants. The atmosphere of the town is unique, partly due to the split between its old and new sections, which are so explicitly separated from each other. As Sandomierz suffered relatively little damage during the two world wars, the remnants of its enormously rich 10-century long history survives to this day in their original form. The density of architectural and artistic gems is remarkable in an area so small. Most of them are located in the Old Town, set in almost rural surroundings. Worth seeing are the Market Square with its Gothic Cathedral and 14th century Gothic Town Hall, later redesigned in the Renaissance style; the 14th century Gothic Castle and Diocesan Museum full of curiosities. Sandomierz is a significant centre of religious activity with four historic churches located within this small town. One very unusual attraction of Sandomierz is its underground passages, measuring some 470 m in length and going round the Gothic cellars of the local traders. Interesting sites near Sandomierz include Baranow Sandomierski (a small town famous for its castle nicknamed “Little Wawel”) and the Pepper Mountains with its 18-hectare nature reserve, from which one can delight in a panoramic view of Sandomierz. Perched on a high cliff over the Vistula River in the Swietokrzyskie voivodship, Sandomierz covers a total area of 28.8 km2 and has 27,000 inhabitants. It is located about 240 km from Warsaw (see also: Warsaw short tours), 170 km from Krakow (check our excurions to Krakow) and 100 km from the border with Ukraine. 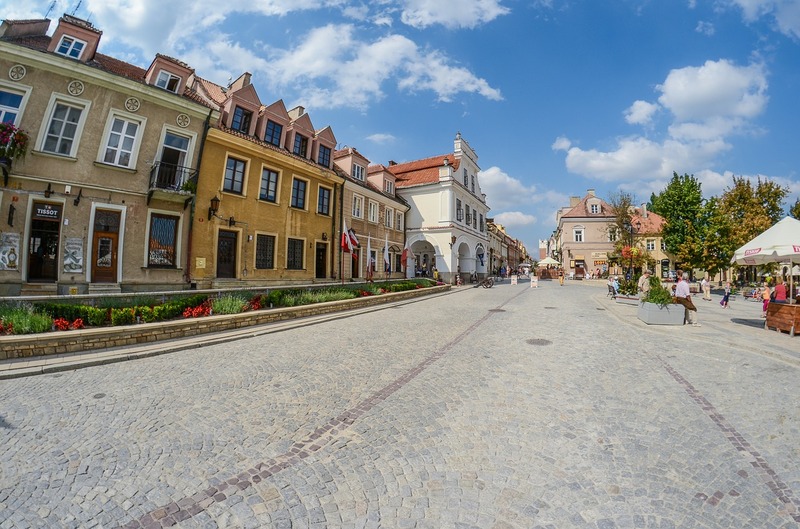 A great asset of Sandomierz is its beautiful location on the border of the Swietokrzyskie Mountains, the Sandomierska Dales and the Lubelska Upland. The sandy loess area where the town stands is cut through by a rich network of gorges – one of the best known is the Gorge of Queen Jadwiga, which is more than 400 metres long. Sandomierz and its environs are favoured by a warm climate with an average annual temperature of approximately 8 degrees C.
Sandomierz developed during the early Middle Ages. The town’s location on significant trade routes beside the Vistula River led to its economic development and prosperity. What is more, Sandomierz played an important administrative role in the nation. The town was first mentioned by Gall Anonim in a chronicle dating from the 11th century. In his will, King Boleslaw Krzywousty declared Sandomierz to be the capital of a duchy. The period of growth was interrupted in the 13th century by Tatar invasions. Sandomierz was given city rights before 1241 and maybe even prior to 1226. Then in 1286 it was given town rights under Magdeburg Law. Once the duchies had been united to form a single state, the Duchy of Sandomierskie was transformed into a voivodship. In the 15th and 16th century Sandomierz quickly developed in all fields and its population rose to about 3,500 inhabitants. Magnificent sacral buildings were erected at this time, a visible proof of the citizens’ wealth. Like many other Polish cities, Sandomierz suffered serious damage during the Swedish Deluge, and the work of destruction was completed when a great fire swept across the town in 1757. It ceased to be a prominent administrative centre and its further development was hindered when it became a border town as a consequence of the First Partition of Poland. Under the Third Partition of Poland, Sandomierz was annexed by Austria and the town of Radom took over its remaining administrative functions. Heavy fighting during the Polish-Austrian War of 1809 brought about further destruction of the town. By the resolution of Vienna Congress, Sandomierz became a part of the Kingdom of Poland. Sandomierz regained some of its former importance when it was made the capital of a diocese. In the course of World War I, Sandomierz and its surrounding area became the site of military operations that resulted in considerable destruction of the town and in a reduction in the number of its inhabitants. Unavoidably, Sandomierz became a provincial town of no significance whatsoever. The awakening came with Poland’s regaining independence. As early as the beginning of the 1920s the town’s image changed radically. With each passing year, Sandomierz became an increasingly dynamic centre of growth. An important stimulus for the economic development of Sandomierz was making it the capital of the Central Industrial Region. The town flourished until 1939. Luckily, it wasn’t destroyed during World War II, and then on August 18, 1944 Red Army liberated Sandomierz. During the 1970’s much time, care and money was spent on renovating the old town, repairing the damage of centuries. Nowadays it is a popular destination of school trips during term time.